Year to date drilled wells in Pennsylvania. Click the map for a larger, dynamic view. So far in 2011, 587 Marcellus Shale wells have been drilled in Pennsylvania, compared to only 281 from other formations. 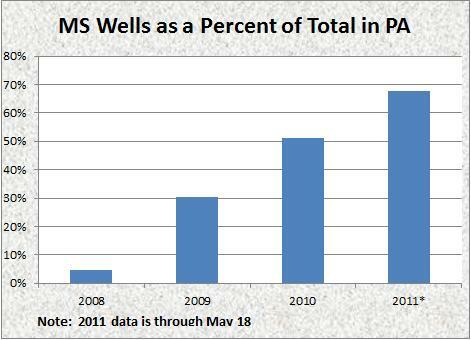 This means that for the first time, Marcellus wells account for over two thirds of the drilling activity statewide. In less than three and a half years, the Marcellus Shale went from representing 5% of all oil and gas wells drilled in Pennsylvania to 68%. Drilling trends over time in Pennsylvania. While part of the reason for the Marcellus Shale’s increased prominence in the oil and gas industry in Pennsylvania is that activity in the formation is rapidly increasing, it is also true that activities in other formations are decreasing rather dramatically. We can also take a look at drilling activity by county for both Marcellus Shale and other oil and gas wells. Marcellus Shale and other wells drilled to date in 2011 by county. Much of the above chart has to do with where the hydrocarbon resources are. It is interesting to note though, that the county with the most Marcellus wells (Bradford) has no wells in other formations, and that the county with the most non Marcellus wells (Forest) has no Marcellus wells at all. Of the 91 operators that have drilled oil and gas wells so far this year in Pennsylvania, 60 had no Marcellus Shale wells, 25 had only Marcellus Shale wells, and seven had wells in both categories. 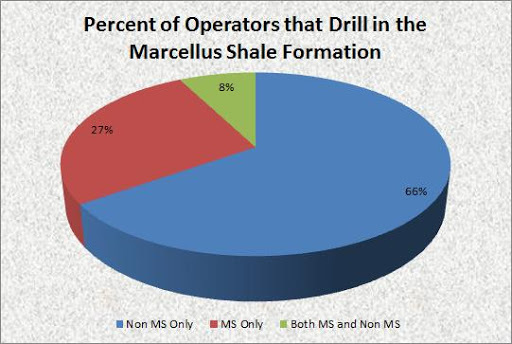 Most operators drill in either the Marcellus Shale or other formations, but not both. There is surprisingly little overlap in this chart. But what about the operators with wells in both categories? 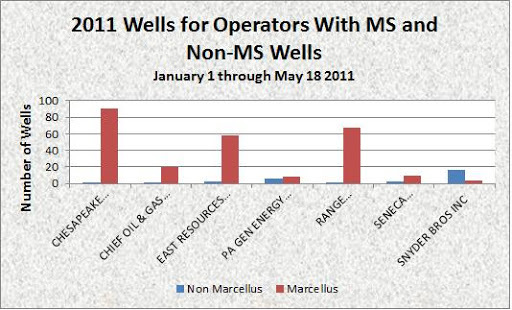 Marcellus and non Marcellus wells for operators with both categories in 2011. Even still, most of the operators specialize in one kind or the other. Taken together, these two charts show that operators which drill in the Marcellus Shale are specialists, with very few wells drilled in other formations. It is well known that the combination of hydraulic fracturing and horizontal drilling techniques allowed for the profitable extraction of natural gas from the Marcellus Shale. For that reason, it isn’t surprising that most of the Marcellus wells are drilled horizontally. What is interesting is that the technique is now being used in other formations as well. Five Non Marcellus Shale wells have been horizontally drilled so far in 2011. 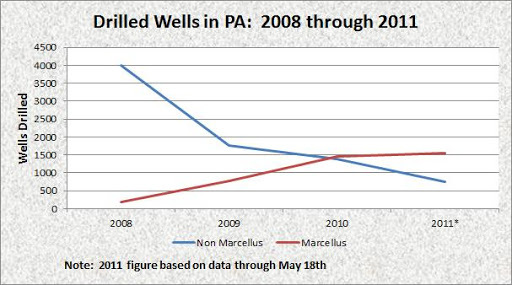 Non Marcellus horizontal wells so far in 2011. There isn’t much of a trend in which companies drilled these five wells, with two of the companies active in the Marcellus Shale and two of them not. Spatially, all four of the counties are in the western portion of the state, with Clarion County somewhat to the north of the other three. DEP = Department of...Economic Promotion?